Then again, in a way it is—but only peripherally. 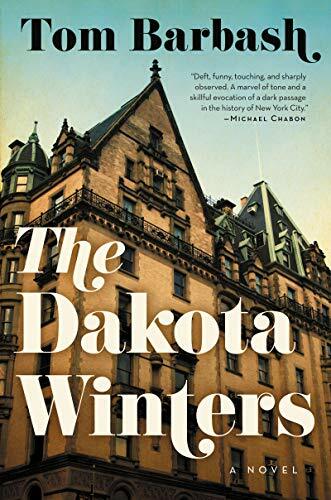 In another way it’s partly the story of the Dakota Building itself, that enigmatic warren of exclusivity in the Upper West side of Manhattan, the nexus between 23-year-old Anton, the novel’s narrator, and the ex-Beatle. Talk show host Buddy Winter and his wife Emily—an accomplished supporting actress until her early 20s and, lately, a fundraiser for Teddy Kennedy in his run for the Democratic presidential nomination—moved into the Dakota when their son Anton was four. Their capacious apartment, with its five fireplaces and two kitchens, once owned by horror movie star Boris Karloff, is perfect for Buddy and Emily’s annual parties which, over the years, attract everyone from Lauren Bacall to upstairs neighbors John Lennon and Yoko Ono, who usually bring along some sushi as well as their small son Sean. In January 1980, Peace Corps volunteer Anton returns from Gabon where he’s been helping people to access drinking water and good nutrition, occasionally swimming with hippos, reading “a lot of Ian Fleming novels,” dancing himself into a trance state (along with 30 others), and even enjoying a solitary fling. A particularly bad bout of malaria puts an end to all that and when he arrives home to recuperate, it’s to a family in flux. Buddy, the face of a celebrated, eponymous, multi-award-winning decade-long national talk show featuring all the celebrity greats of its era, is blowing in the wind of a nervous breakdown. Instead of getting the help his dramatic mid-show meltdown warrants, he finds himself pilloried—not least by members of the large production crew, who were banking on him for their almost-forever jobs. His son’s illness seems to evince a strange sort of pride in Buddy, who tells anyone who’ll listen how Anton contracted it in Africa, reeling off a list of famous authors, artists, and politicians who’d caught it, as well as those who died from it, as if to put a glow on its acquisition as shiny as the sweat on his son’s fevered brow. At least it gives him a chance to bond with Kip, his 15-year-old brother, who’s saved up a stack of teen-tickling dirty jokes while Anton’s been away, and to wander the city streets to movie houses or museums with his rudderless father Buddy. But instead of reconnecting to a familiar world, over the course of a year Anton increasingly finds himself an outsider in his own city, seeing everything through almost unfamiliar eyes, which happily means the reader gets to experience them in acute and well-drawn detail. “Get something a little bigger than that,” Anton tells the singer. From beginning to end, and through its many twists and turns—including a true-life-based uniquely Lennon-ish sailing trip from Rhode Island to Bermuda accompanied by wonder, fear, and some scarily life-threatening weather—the book is cleverly suffused with New York sensibilities, politics, pop culture, and celebrity as it seamlessly segues between fact and fiction.